Space. The deep black. The awful emptiness. The final frontier. The fringe. There are all kinds of names and monikers for what is beyond the atmosphere of Earth. For as long as humans have looked up towards the sky, people have created stories about space. From aboriginal tales of gods and demons coming from space, to writers like Jules Verne, to modern day screenwriters like George Lucas and James Cameron, people have looked to the sky and said ‘What if?’. Now, people who follow Star Wars: The Old Republic have a ‘What if?’ of their own. What if space is part of the game? Well, what if it is not? Would you play it without a space component at launch? Think about it. Star Wars has the word ‘Star’ in it. It is not Planet Wars, or Ocean Wars, or Sky Wars. It is Star Wars. The very first scene of Episode IV, after the introduction writing, is of two starships, a small one and a huge one, fighting in space. To this day, I get a small thrill when I see the image of the imposing huge white bulk of an Imperator class Star Destroyer. 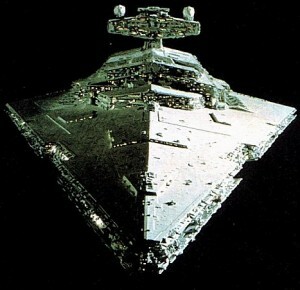 Ok, ok, for those purists out there, an IMPERIAL class Star Destroyer. Whatever… The image of X-wing starfighters diving in to attack the first Death Star was one of the most iconic scenes ever made in a movie. So from the very beginning, the stories have included space. It was added on with the later movies, with the battles becoming more epic in scope. Love the prequels or hate them, the space battle images from Episode III, especially the battle of Coruscant, were epic. Star Wars games likewise have been very focused on space. Everything from Empire Strikes Back for the SNES to The Force Unleashed has shown space as an integral part of the Star Wars story. But it hasn’t always been playable. Games such as the X-wing series, the Battlefront Series and the Empire at War Series have all shown what is possible in Star Wars. Even Lego Star Wars has space missions. But is it possible to do such a thing right in a MMO? Take Star Wars Galaxies. The people in charge tried to make space a part of the game. To their credit, they delivered most of what they promised. It was flawed in a number of ways; it was shallow and more than a bit boring. Grind, grind, grind, do mission, grind, grind, grind. Lather, rinse, repeat. It got old after a while. I personally played space more than the ground side, because I was a huge fan of X-Wing Alliance and older titles. What can I say? I like blasting TIE fighters out of the sky. There is a problem in a MMORPG however. There is more than one kind of person playing the game. From my own personal experience, people who like space games usually fall into two categories. There are those people who like to ‘see what is out there’. In effect, they are explorers. They are driven to seek out new life, new civilizations, to boldly go… Oops, wrong game. Essentially, they are there to see what is there. To explore, to find things, to visit strange places so they can talk about them. Or just to collect the badges, whichever comes first. Then there are the people who like to blow stuff up. Come on, you can admit it. I know I do. We live to make things go boom, the bigger the better. There was nothing at all more satisfying that blowing up a Star Destroyer in the original X-Wing game with a Y-wing. Or taking on a rebel fleet with a single assault gunboat in TIE Fighter. Or watching the second Death Star blow up after flying the Millennium Falcon through its innards at full speed in X-Wing Alliance. Player versus Player or Player versus Environment, space simulators are just fun! But as in all things, there is no free lunch. A MMO is a big undertaking, and this MMO is apparently larger than almost all the others ever made. According to Bioware, this game is larger than every single other game they have made put together! There is a lot of work that has to go into any MMO. Do we want a space component? Exploration or combat or both? Oh HECK YES! But what if it detracts from the rest of the game? What if, in making a space simulator of some kind, which is not an easy enterprise all on its own, parts of the rest of the game get neglected? This is what happened in SWG I believe. They focused so much on the space expansion that everything else went on the back burner, bug fixes, additional content, everything. My personal feeling is this. Space is an integral part of what makes Star Wars special. The aliens, the cool locations, the evil bad guys, the not so nice good guys, all of these are important – but space is what really makes Star Wars. That was what I really missed when I started SWG. It was the only reason I stayed as long as I did, first the promise of the Jump to Lightspeed expansion, then when it came out. It had problems, yes, but it was space combat and I got to blow up TIE fighters! If the rest of the game hadn’t gone so belly up with the changes, I might still be playing it to this day. So to answer my first questions: Space is important. At least some kind of nod to space is absolutely required by anything Star Wars related. Knights of the Old Republic had the gun turret scenes. The Dark Forces and Jedi Knight series had multiple references to space even if you couldn’t do anything in space. Jedi Academy had a mission where you had to use turrets to defend against TIE fighter attack – it was cool, but it lacked something. Something that all of us Star Wars simulation freaks knew and loved: the freedom to fly in space. I am willing to bet that even if it is not available at launch, that somewhere later down the line, some kind of space content will become available. Because it is, in the end, Star Wars. As for me? I will play the game even if it doesn’t have a space component at launch. If it does, you will not be able to drag me away from it with a tractor beam.